Ever heard of the movie, 'Modern Girls'? It was a silly, girlie flick from the 80's starring a pre-Melrose Place, Daphne Zuniga and pre-botox Virginia Madsen, along with Cynthia Gibb (whatever happened to...?) - where they embark on an L.A. night out that ends up being anything but typical. With the likes of 'Pretty in Pink' and 'Ferris Bueller', 'Modern Girls' easily got lost in the shuffle of yet another crazy 80's 'teen' movie. Shame, really. The underlying current of the movie was of a romance that grew when two mismatched people get foisted together during an evening adventure when everything seemingly goes wrong. When I saw the write-up for Michael Cera's next feature, 'Nick & Norah's Infinite Playlist', it made me yearn for 'Modern Girls.' The story is similar...boy meets girl. Boy and girl get lumbered with each other on a misadventure. Boy and girl, over the night's festivities realize that they're hot for each other all the while their exploits are framed by a trendy soundtrack. A few of the nuances between the films are different but the main frame is the same. I, for one, can't wait! 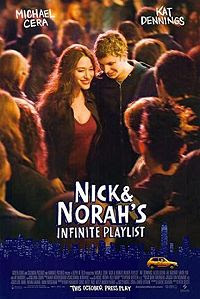 And if the bloom of an unexpected romance isn't enough to pull you in, 'Nick & Norah' is also drawing comparisons to the lovely 'Before Sunrise' for obvious reasons -- another good reason for viewing in my books! The flick opens in early October -- watch for it!